The Beauty of Change | It's In The Sauce! Fall has finally come, although in the South with temperatures still in the 80’s, it doesn’t feel like Fall. Regardless, it is. Fall is being talked about as the second new year. This time in the year we seem to reset, and begin anew. Children in traditional school year schedules are back in school. Vacations are over. Work again takes more of a priority than family and play, which seem to get more attention in the summer. September is our transition month, that time between summer and holidays. Once October arrives, there is Rosh Hashanah, Yom Kipper, Halloween, then Thanksgiving, followed soon by Hanukkah, Christmas, and Kwanza. Please forgive me if I have left any holidays out! With Fall also comes changing of the days and nights. Days are shorter, and daylight comes later. Change is occurring on many fronts. I was reminded of these changes in Church recently. Our church, where we have attended since 1988, has just begun the physical changes of a major renovation. As such, we have moved out of our main sanctuary for at least 18 months. Our Sunday church services are now being held in our recreation center, a space we will be sharing during this time with the Rec Center activities. Mike and I were at church the first Sunday of this change, which occurred several weeks ago. Sitting in the temporary sanctuary, I was struck by how different it felt. There had been many people planning these moves for months, and all went well, to the observer’s eyes, at least. The Pastor had his podium, the choir had their space up front, and the congregation had ample space in which to worship. So, no necessary functions were without space, although all had been displaced. But it felt different, all the same. It WAS different. I was reminded of how one feels when you come into church to claim “your” seats, and someone else is sitting in them! No, those seats did not have your name on them, but they were where you usually sat. To sit in a different area created an internal angst. And as I sat there pondering my feelings of these changes and differences, several thoughts came to mind. I thought of this church where we have worshipped for 28 years. This was our church when our two daughters were in middle school, youth group, and high school. Their youth director, Jeff Roberts, is now our senior pastor, and has been for many years. (Dr. Roberts left our church many years ago to pastor elsewhere, and was called back years later to be our senior pastor by our congregation.) I also remembered Dr. Bill Furr, our senior pastor when we came to the church, who could call most parishioners by name, all 1000+ of us! He was truly amazing, as is Dr. Roberts. I remembered our daughter Tara’s wedding in this church 14 years ago, and thought how sad that the physical layout of the sanctuary in which she was married is changing. Then I remembered that this is a good thing, for the “old” sanctuary had two main aisles, so brides could not go down a center aisle and be viewed from both sides equally. While this may not seem like a major problem, it has created some challenges for weddings. As I looked around at our temporary sanctuary that Sunday, I saw some things that felt better. The space between the front and the congregation was much closer, creating a feeling of connection not possible in a huge sanctuary. The entire space was smaller, and felt more intimate. My mind also wandered to the experiences of friends of ours who are like family, and the changes they have experienced these past few years. After being in the same church for more than 50 years, they have now, with others, started two other churches. These changes were a result of division in their original church and the one that was started after leaving that church. With grace and dignity I don’t know that I could exhibit, they continue to worship in the same manner they always have, regardless of the changes in physical structures and the congregations. Their witness reminds me of the sign on a church building in Alabama, which reads: “This is the building where the First Baptist Church comes to worship.” Yes, the building is not the church. The church is the people. Change, whether it is in physical structures or otherwise, is usually unsettling. We are creatures of habit, and when our physical space is disrupted, we feel disrupted. And it is true that all change isn’t good. But what is also true is that there is usually good that comes from any change, even change that we do not want, and may even resist. So, think of some changes that you are facing, or need to face. Expect that those changes may be disruptive. Consider the cost/benefit analysis (and not necessarily financial, but otherwise) of the changes you need to make, and decide if you are willing to make those changes. Recognize that with all gain comes some loss, and that loss usually involves some gain. Also recognize that staying still is not an option. We are moving forward, or getting behind. 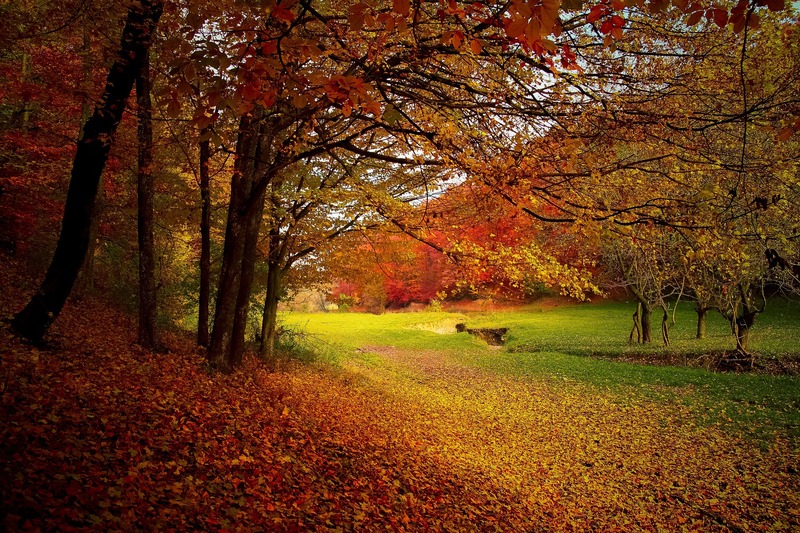 Think of the beauty of Fall, and that the beauty only comes through change. What beauty awaits you? To experience the beauty, don’t allow yourself to wait too long to make whatever changes you need to make.